Your stone flooring needs a careful, considered approach when being cleaned and restored and at Hydro Kleen, we have the skill, tools, training and knowledge to take your floors to a new level of finish. Victorian tiled floor cleaning and sealing. You have complete peace of mind when you use our stonecare services as we have invested thousands of pounds in this area to make sure we have excellent knowledge (trained by the UK's leading stonecare teams TileMaster and Nu-Life) high spec equipment and the best possible range of floorcare products to give you the best possible level of finish. As always, our work is fully guaranteed for 7 days. Our customers from the property in the photo to the right have a 209 years old white marble and black limestone floor. It was looking dull, lifeless and uncared for when we went to quote for the work. We visited the property twice before we started the work to ensure we were dotting the I's and crossing the T's with the detailed requirements. The floor was deep cleaned, diamond polished and impregnated for optimum protection and a high level of finish. The results speak for themselves as you can see. It is difficult to know who to trust with your valuable floors and no doubt you will call around to ask for quotes. Every stone floor we work on is quoted face to face and we will never just estimate a price over the phone - ths is specialised work and you should make sure it is examined before it is priced for. If you would like us to clean a sample patch for you during our face to face quotation, we will be delighted to do that for you. You tell us when we can leave - we don't pack up and tell you the work is finished. You decide when the floor is to your satisfaction. We don't just use one system or one piece of floor cleaning equipment - we will arrive equiped with several pieces of equipment that all add up to a better, more thorough clean on your floor. You decide what level of finish you would like on your floor - some of our customers prefer a shiny / gloss appearance and some prefer a more natural (honed) look. If you are unsure which would be most suitable, we will be more than happy to advise you. 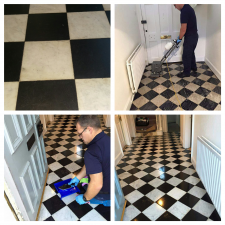 Great care will be taken in your property to protect the areas that are not being worked on - we will cover and protect the surrounding floors to ensure they are not affected by the work we are doing for you. The most appropriate floor sealer / impregnator will be used to finish your floor. We have many different seals that work in different ways and we will always select the best one for your floor that is most appropriate to the level of finish you require. At the end of the job, you will be given a complimentary bottle of professional standard, easy to dilute neutral floor cleaner to keep your floor in great condition (Our product is too good to be found in any supermarket or DIY store). You will be advised on how to care for your floor once we leave so that you can keep it in tip top condition. All of our work is guaranteed for 7 days after completion, so you use our services with complete peace of mind. Why would you look anywhere else?